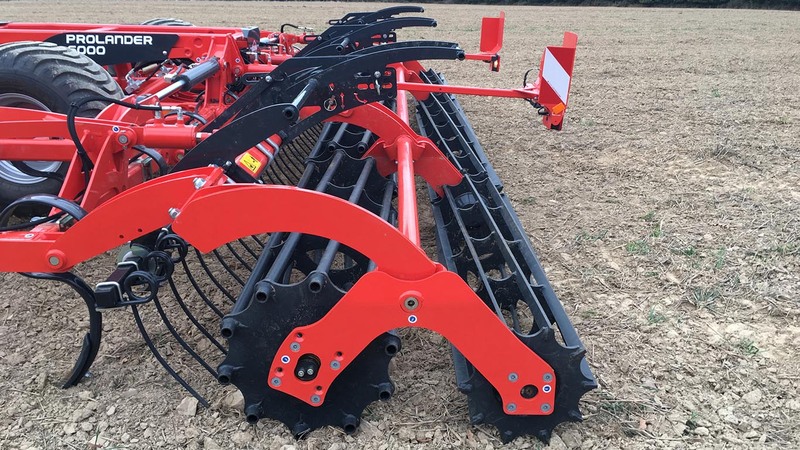 KUHN Farm Machinery has launched a variety of optional accessories to enhance its range of PROLANDER, CULTIMER AND OPTIMER cultivators. The PROLANDER range of vibrating tine stubble cultivators receives a new tine which uses a single bolt to hold a hard-wearing, easy to change and reversible share in place. The single-bolt design reduces the amount of downtime incurred when replacing worn parts, while the heat-hardened share, which is also thicker than standard versions, has a lifespan up to 20% longer than ordinary, non-hardened parts. A new tube and bar combination roller is also available for the PROLANDER: a 550mm diameter tube roller and 420mm bar roller are mounted together to ensure excellent soil crumbling and weed management when working stubbles on a min-till basis. A new V-LINER roller is available for KUHN’s CULTIMER (tine) and OPTIMER (disc) cultivators: featuring v-shaped press rings at 12.5cm intervals, the V-LINER ensures good soil consolidation, even in wet conditions. Cleaning blades are located between each neighbouring pair of rollers to prevent clogging and to enhance the crumbling of heavier soils. These blades can be retracted to avoid excessive consolidation when working in loamy soils. The CULTIMER range has been further enhanced by the optional inclusion of KUHN’s continuous hydraulic adjustment system. This system, which is already available on the OPTIMER XL and PROLANDER ranges, enables the working depth of the cultivator to be adjusted from the comfort of the tractor cab: this not only enables the cultivation depth to be adjusted as soil conditions change, but also reduces operator fatigue, fuel consumption and machine downtime, thereby increasing daily output.